The British have always made a rich contribution to US immigration, landing on American shores in their droves for a variety of reasons throughout history: as colonists, army invaders, rock groups, corporate predators, entrepreneurs, spouses of US citizens and more recently, as holiday shoppers. Some have come with permission and have been welcomed; others have not. Today the US immigration landscape is clear for some, but not for all. The official numbers tell an interesting story about current immigration trends from the UK. Just who and how many British are coming, how are they getting in, and are they here to stay? The number of British citizens admitted to the US as nonimmigrants has always been near the top of the tables, according to the Department of Homeland Security’s Immigration Yearbook Statistics. Non-immigrants are those who travel to the US for a temporary period and include visitors for business or pleasure, students and exchange visitors, and temporary workers. In 2013, there were a total of more than 61 million non-immigrant admissions to the US with a completed arrival card (Form I 94). 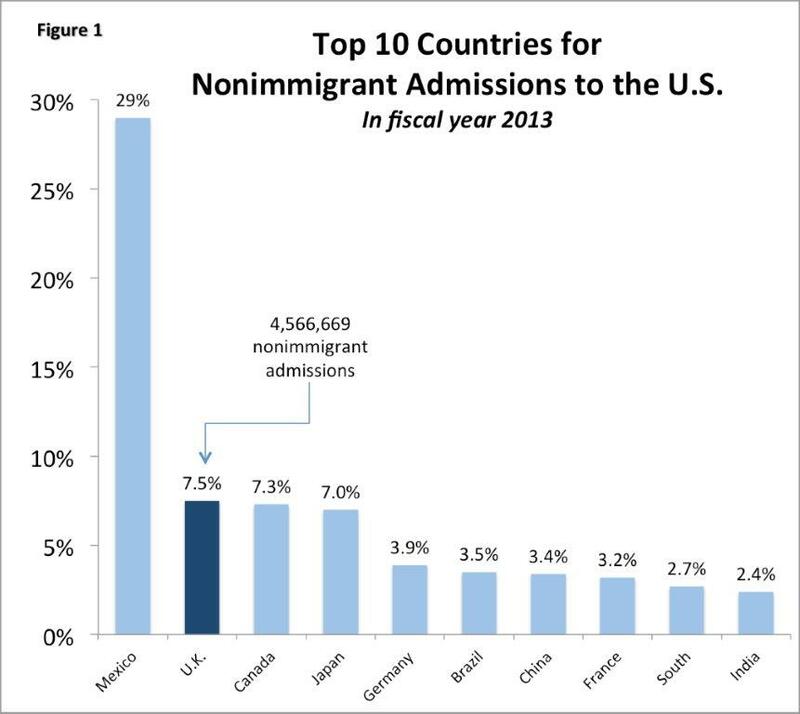 After Mexico, the UK represented the second largest country with 4.567 million non-immigrant admissions (representing 7.5 per cent of the total) (Figure 1). 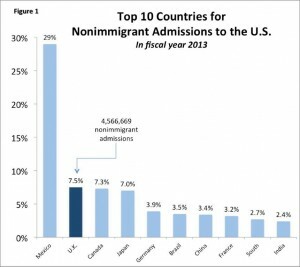 The overwhelming majority of British non-immigrant admissions to the US (4.3 million or 96 per cent) in 2013 were for pleasure or business purposes. 4.1 million of these admissions were pursuant to the Visa Waiver programme which permits certain British citizens to travel to the US without a visa for a period not exceeding 90 days. To be eligible, they must have a valid unexpired machine-readable passport, travel on an approved carrier, possess a round trip ticket and waive their right to contest an immigration officer’s determination of admissibility and the right to contest removal. Participation in the Visa Waiver programme is only possible after obtaining travel authorisation through the Department of Homeland Security’s Electronic System for Travel Authorisation (ESTA) which is valid for two years. Not all British citizens are permitted to use the Visa Waiver programme. For example those with criminal convictions or prior immigration violations must obtain a B-1 or B-2 visa to enter the US for business or tourism. The British also comprise a significant number of the foreign student and exchange visitor populations in the US entering the country on F-1 and J-1 visas respectively (Figure 2). Although the majority of student and exchange visitor admissions in 2013 hailed from China, Canada, Mexico, South Korea and Saudi Arabia, the UK was the second leading contributor of students and exchange visitors from Europe with more than 47,481 admissions, slightly behind admissions by German students and exchange visitors with 50,957 admissions. 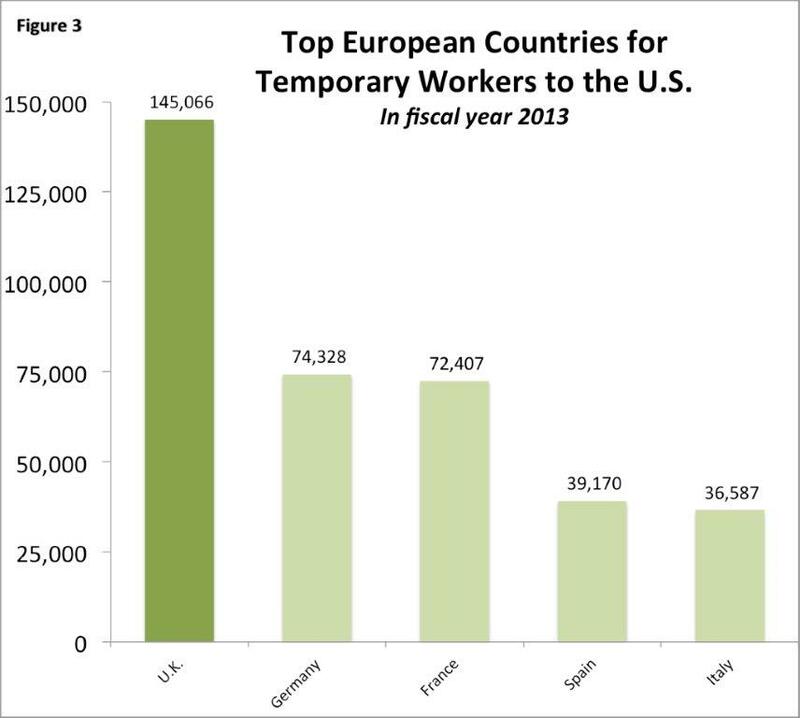 Reflecting the strong trading and investment ties that the UK has with the US, the UK led the charts for the admission of European temporary workers to the US with 145,066 admissions (Figure 3). German admissions ranked second in this category with 74,328. Worldwide, Canada (863,826), and Mexico (633,000), topped the charts primarily due to their close geographic proximity and their access to Trade NAFTA visas. India’s high number (369,377) is a testament to the highly sought after technology skills of its citizens, and Japan’s strong showing (163,922) reflects the significant trading and investment relationship between the US and Japan. The British have access to four main non-immigrant work visa categories, each with their own eligibility criteria and processes. The most utilised option by the British in 2013, with 49,665 admissions, was the L-1 Intra-company Transferee Visa that is available to executives, managers and specialised knowledge personnel who have worked for an overseas parent, subsidiary or affiliated entity for one full year in the prior three years (Figure 4). The British also recorded 19,212 admissions in the H-1B visa category that is available to Specialty Occupation workers who will work in a job whose minimum requirements are a degree in the field of their work. Interestingly, the British were admitted in significant numbers (13,647) on an O-1 visa, a category that is reserved for those who possess extraordinary ability in the sciences, arts, education, business and athletics and are considered to be leaders in their respective fields. Finally, there were 15,479 admissions of British citizens in E visa classification, which is available to British E-1 Treaty Traders and E-2 Treaty Investors who are to work in executive or supervisory positions for British-owned entities or have skills considered essential to the trade or investment. The number of British citizens who acquired permanent resident status (the green card) is significantly less on a worldwide basis compared to the admission numbers of British non-immigrants. Of nearly 1 million persons who obtained permanent resident status in fiscal year 2013, only 12,984 were British (1.13 per cent of the total). 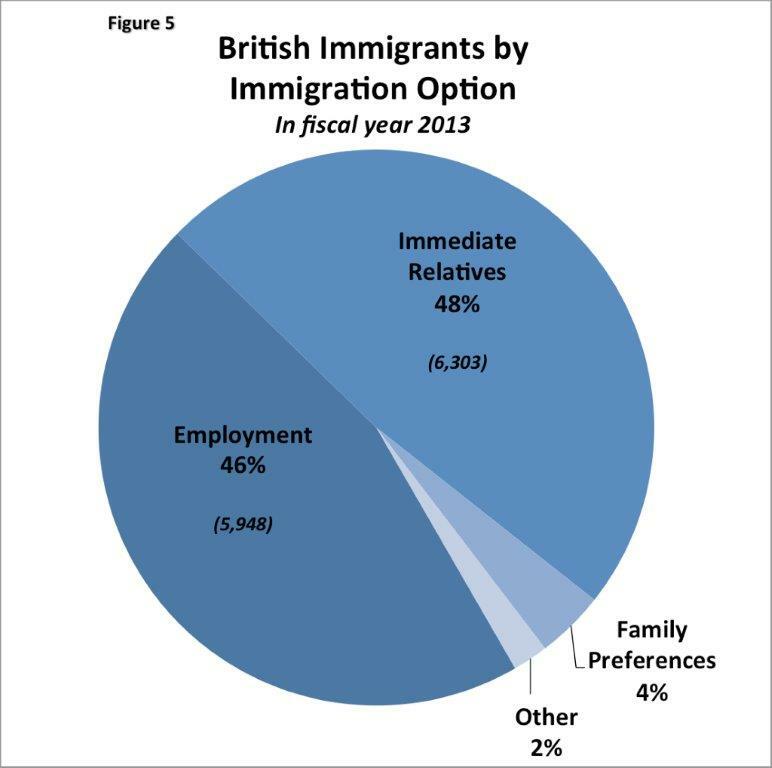 However, these total numbers fail to reveal the relatively substantial numbers of British immigrants within two particular categories of admission: employment-based immigrants and immediate relatives of US citizens. The US has five main avenues of permanent immigration: family-sponsored preference immigrants which includes sons and daughters of US citizens and spouses and children of permanent residents; employment-based sponsored immigrants that includes multinational executives and managers, persons of “extraordinary ability”, and persons for whom there exists a shortage of available and qualified US workers; immediate relatives (spouses and children) of US citizens; diversity immigrants that permits natives of selected “low admission” countries and regions to immigrate in a lottery system; and asylum seekers and refugees who have a demonstrated fear of persecution in their home countries based on race, religion, nationality, membership in a particular social group and political opinion. Within these fi ve immigration options, British immigrants ranked seventh based on employment-based sponsorship, behind China, India, Canada, South Korea, Mexico and the Philippines with 5948 immigrants. Also, British-American family relationships would appear to be thriving with more than 6000 British obtaining permanent resident status as immediate relatives of US citizens in 2013 (Figure 5). It is clear from the data that the British continue to enjoy an array of temporary and permanent immigration options to the US, however not all British are welcome with 1925 persons being refused admission in 2013. There are numerous grounds for visa refusals including a failure by the applicant for a non-immigrant visa to overcome the presumption of immigrant intent, and other inadmissibility grounds include health grounds, prior criminal behaviour and immigration violations. Waivers of the inadmissibility grounds are possible and there is a general waiver option for non-immigrant visa applicants where the Attorney General evaluates a risk of harm to society if the applicant is admitted, the seriousness of the applicant’s prior immigration law of criminal law violations and the reasons for wishing to enter the US. A number of British are apprehended and removed from the US each year. In 2012, 425 British were apprehended in the US out of a total of approximately 1 million apprehensions, and 313 British were actually removed from the US (181 of which were for criminal reasons). Finally, in 2013 the US welcomed 9459 British as naturalised US citizens out of a worldwide total of 779,929. This number of British citizens who were naturalised is approximately 75 per cent of the number of British citizens who acquired permanent resident status suggesting that 3 out 4 British immigrants will eventually wish to naturalise. US naturalisation is an option for persons who have held their principal dwelling places in the US as permanent residents for 5 years and have been physically present in the US for two and a half years, although these time frames are reduced to three years and one and a half years respectively for spouses of US citizens. Other criteria include good moral character and satisfactory knowledge of American history and civics. Over the centuries, the British have contributed in many ways to shape the United States beyond its language. America has enjoyed British food (from roast beef to apple pie); its harvest festivals at Thanksgiving; its music and sports; its architecture and its law. Most of America’s Presidents have been of English extraction (even in times of war between the two countries). Little wonder that the immigration numbers from the “old country” to the new continue to thrive in the 21st century, especially when it comes to business and family relationships.